Pretty much everyone these days travels with a smartphone or tablet device – and we’re no exception! 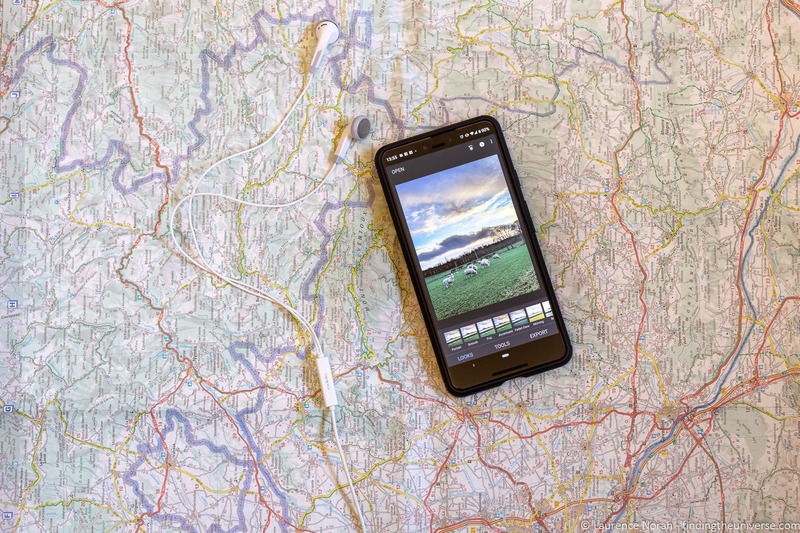 In this post, we’re going to round up what we think are the best travel apps that we use on a daily basis when we travel. We’ve been using a smartphone in our travels since 2010, and in that time, we’ve seen a lot of apps come and go. Not to mention a lot of smartphones! In that time, some apps have really stood out, and earnt a permanent spot on our phones. These apps will help you do everything from getting around through to staying in touch through to navigating your way through a foreign language. 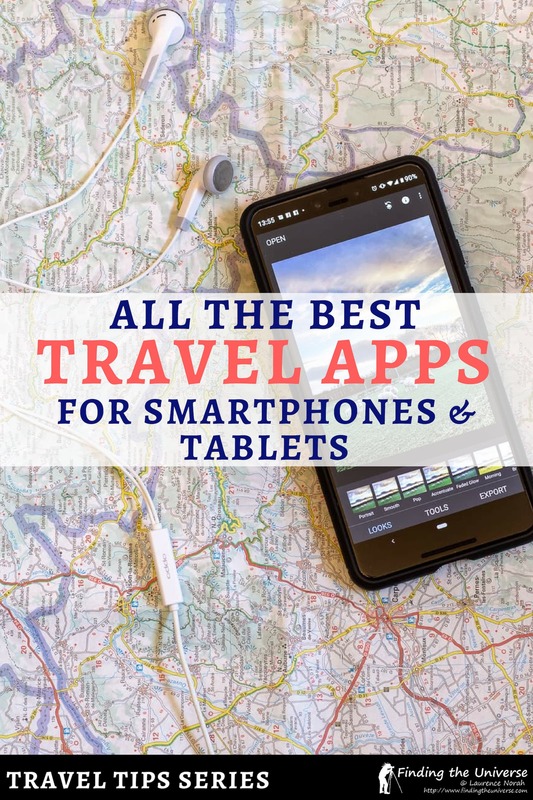 Let’s get started with our list of favourite apps for travel! One thing you are going to need when you travel is an idea of where you are, and where you are going. In the old days, that usually involved buying various street level maps, and whilst we do still enjoy a nice map, we’ve pretty much switched to Google Maps to help with the majority of our navigation. Google Maps has evolved over the years to become an incredibly useful app for travellers. It features the capability to download areas for offline use, routing that includes public transit, walking, cycling and driving, and you can save locations under various categories to help you plan out your day. 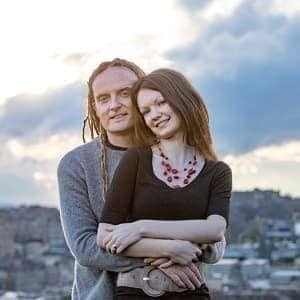 We use Google Maps on a daily basis when we travel, both for helping us plan our routes, and we also save various lists of different types of attraction we want to visit, so we can keep track of our itineraries. 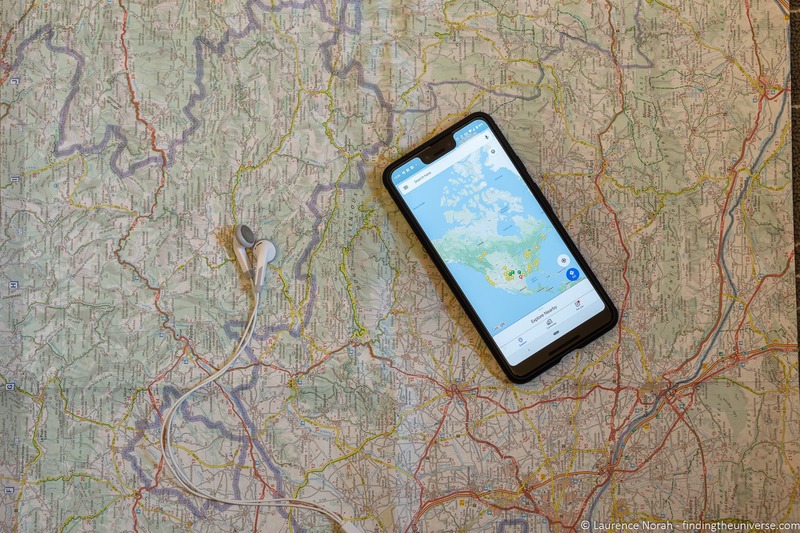 One tip – if you’re travelling to a country where you don’t have data roaming, always download the map of the location in advance, so you know where you are as soon as you arrive, without having to search for WiFi. Another feature of Google Maps is that you can share your location with selected friends and family members. This can be a useful way to keep close relatives informed as to your whereabouts, as they’ll always be able to see you on a map if they want to. Free, available on Google Play for Android and the iTunes store for iOS. Convertpad has been a part of my favourite travel apps toolkit for as long as I’ve had a smartphone. It’s an app that, as the name suggests, lets me convert from one series of units to another. As a traveller it’s most handy for the up to date currency conversion rates, but you can also convert nearly anything else, including shoe sizes, length (ever wondered how many twips are in a metre?) and many more units that you have certainly never heard of. Until the world decides to agree on a universal measurement system for temperature, weight, distance and clothing sizes, this app is the next best thing! Available on Google Play for Android (ad-free and paid versions), similar tools are available for iOS. If you travel a lot, then keeping track of itineraries, flight numbers and train times can be a bit of a headache. Enter TripIt, which connects to your e-mail accounts, keeps an eye out for booking confirmation e-mails, and puts them all into a travel itinerary, including details like your booking reference, seat number and so on. It’ll even tell you the forecast weather for your trip, and can pop all your trip details into your calendar for you. Available on Google Play for Android (ad-free and paid versions), and the iTunes store for iOS. If Google Maps is the perfect offline mapping application, then Triposo is its equivalent offline guidebook app. 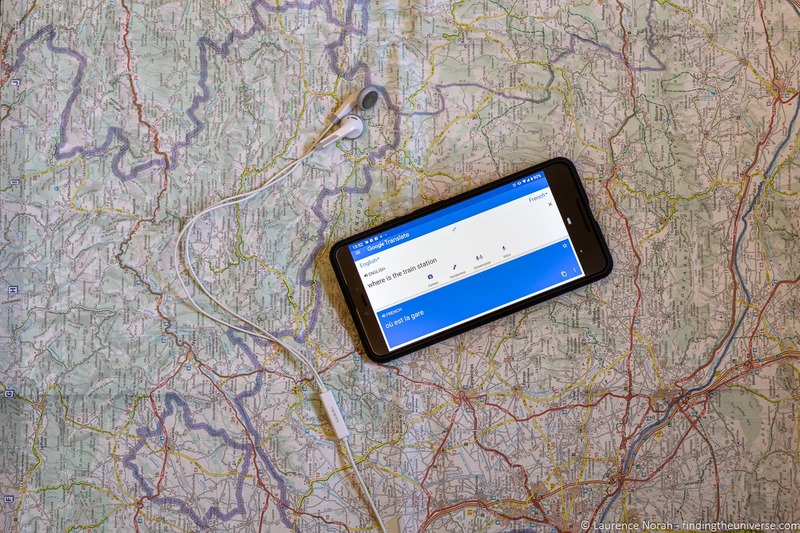 Pulling data from crowd-sourced travel sites like WikiVoyage, Triposo lets you download country or city guides to your device for use offline. Being crowd-sourced, it is only as good as the data the users put into it, but we’ve found it handy for finding the main attractions in a new city, as well as insights on how to get around and where to eat. Plus, at the price of free, it can’t be beaten! Available on Google Play for Android, and the iTunes store for iOS. The amount of information that we store on our smartphones these days is quite amazing, making the loss of one a potential serious security risk, particularly if you don’t have a PIN or other security feature enabled. Imagine a thief not only having access to your shiny device, but also full access to all your e-mail, social media accounts, cloud storage… the mind boggles. That’s why Prey remains on my essential travel apps list. It lets you remotely lock, wipe and track your device should the worst happen. Google now offers Android owners the Android Device Manager, which has some of the functionality of Prey, and should definitely be activated, but Prey has additional features, including SMS activation, that make it a more powerful alternative in my mind. Free for up to three devices, which includes laptops. Google Translate has a number of significant features that make it a must have travel app. You can download languages for offline translation, take pictures of writing in foreign languages and have it translated automatically, and if you use a Google Pixel phone, it can do real time translation between you and another person! The offline feature does require the download of the dictionary data for the languages you’d like to translate between, so you’ll want to do this in advance of your trip to be sure you have them available. Free. When you’re travelling, you’re likely going to be taking pictures of your adventures to share with friends and family. We highly recommend the easy to use Snapseed editing application to give your photos that extra bit of pop. It’s got everything you need for photo editing on the go, and happens to be free to boot. I wrote a full guide to Snapseed here – once you’ve tried it, you won’t need any other photo editors! Whilst there are many apps for communication, Whatsapp has achieved a high market penetration, meaning that it’s more likely the person you are trying to message is using it. We often find when we travel that Whatsapp is the default way to communicate with folks like our accommodation hosts, or tour leaders. Because it’s linked to your phone number, you don’t need to set up a new username, you just need to be able to receive a text message to verify your account. Then messages (and calls) are sent over your data or WiFi network instead of your carrier cell network, which can often be costly when roaming. Because it needs an SMS code to activate, we definitely recommend you install and set Whatsapp up before your trip. We always have a Skype account with some Skype credit active on our phones. The reason for this is that whilst we often have data or WiFi, sometimes we want to call someone when we are travelling, and using our phone network to do this can be expensive. Instead, we use the Skype calling feature, which lets us call both landlines and mobiles at much more reasonable rates than our mobile provider! Of course, this does require a data connection, but as WiFi is fairly easy to come by when travelling these days, this isn’t too hard! See our guide to getting online when travelling for more options. Skype is free for Skype to Skype calls and messages, and you can buy credit for calls to landline and mobile phone numbers. If your bank has a travel app, we can recommend installing it and setting it up before you leave. Using your banking app on your phone will let you do pretty much everything you would need to be able to do when travelling, and it usually will have the contact phone numbers for your bank should you need to call them for anything. Many banking apps also have additional features these days, such as real-time spending alerts, and the ability to freeze your cards should you lose them. In addition, using your banking app on your phone, especially over your networks data connection, will be a lot more secure than logging into your bank accounts website through a browser window on a public WiFi network. For more on security, see our VPN app recommendation below. Dropbox is a cloud based file storage app which we use a fair amount when we travel, primarily as a backup repository for all our documents. We keep things like flight information, hotel bookings and other trip related information in here, as well as other files we might find useful, like our itineraries and notes on our trips. Sure, it’s not a critical app to have, but it’s always good to know these things are in the cloud and we can access them should we need to, and even download them to be printed off if necessary. Dropbox is free for personal use up to around 2GB of storage, with paid options available. It’s available on Google Play for Android and iTunes for iOS. Unsecured public WiFi networks are a security nightmare, but we all use them when we travel. To keep your data safe, we recommend you install and use a VPN. A VPN, which stands for Virtual Private Network, creates a safe, fully encrypted connection between you and a third party, meaning anyone using the public WiFi network can’t see your data. Of course, for this to work, you need to use a VPN company that is reputable and trustworthy. We recommend NordVPN in this regard. They are a very highly rated outfit with servers around the world, and their pricing is fair. The NordVPN app is free but you need a subscription to the NordVPN service. The best pricing usually comes if you purchase a number of years of service at a time. App available on Google Play for Android and iTunes for iOS. Sign up for a NordVPN account here. And that’s our summary of some of our favourite travel apps! Did we miss your favourite, or do you have any questions about the above? Just let us know in the comments below!